The mature, modern prima ballerina can express her artistry in so many ways apart from wishing to be cast in the repertory of her choice. These days, customized, or vanity, “projects” are not uncommon. In New York this week, Sylvie Guillem’s Life in Progress, at New York City Center, celebrated her farewell to American stages at the age of 50. Nowhere in sight were toe shoes or plucked feathers; rather, she chose repertory by leading modernists Akram Khan and Mats Ek, with a duet by William Forsythe danced by guest artists from his company. Khan’s Technê, a US premiere, featured Guillem squat-walking in a circle like an animal around an oddly uncredited, sculptural mesh metal tree, touching it as if it were an interloper, to live music by Alies Sluiter. This study of odd slinky moves punctuated with an occasional whipped spin or leg gave Guillem chances to show off her extension and feet (but not her copper hair, covered by a brunette cropped wig). 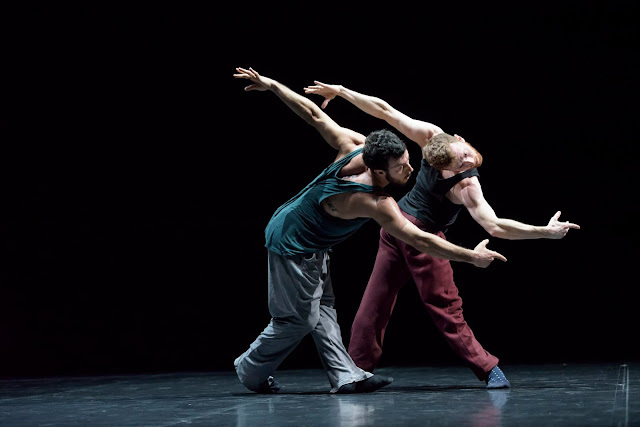 DUO2015 by William Forsythe, with score by Thom Willems, was danced by two of his company members, Brigel Gjoka and Riley Watts, both superb translators of his humorous, torqued style. Unfortunately, in this program designed around Guillem, it proved to be the most kinetically interesting. Careful poses, at times contortions, mixed with bursting phrases; they retreated upstage into the dark, and then darted forward in spins and quick tours. It was a reminder of how well-suited Guillem is for Forsythe’s contemporary style, which relies on a foundation of ballet around which to build anti-balletic shapes. Memories would have to do. Guillem returned with Emanuela Montanari in Russell Maliphant’s Here & After (also a US premiere). To Andy Cowton’s mystical, pulsing strings, the orange-clad duo was bathed in similar shades of striated light. They swept their arms in ovals and around one another’s head, crafting swirls and curves in synchronicity, clockwork-style. An exercise in style and timing, it didn’t reveal much about the two dancers. The finale was suitably titled Bye, a reprise from Guillem’s 2012 stint at the Koch. It’s understandable why she would want to include it—a symbolic farewell that shows her stepping into, or returning to, another life. Its dramatic emphasis allowed Guillem to strike some singular poses to show off her lines, but the frumpy costume (by set designer Katrin Brännström) did her no favors. The packed house applauded heartily as it bade farewell to Guillem the dancer. But given her curiosity and resourcefulness, who knows in what capacity we might next encounter her?